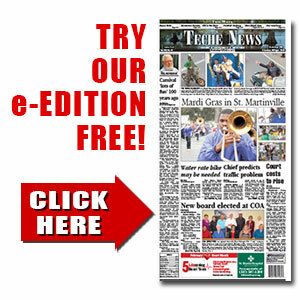 St. Martin Parish arrests for Friday, Nov. 14, through Sunday, Nov. 16 | TecheToday.com | Teche News | St. Martinville, La. Bertha Alexander, 46, 1000 block of Hilda St., Breaux Bridge; outside agency warrant – extradition required (SMSO). Kip Barras, 50, 1500 block of Old Spanish Trail Hwy., Broussard; domestic abuse battery (SMSO). Ted Boudreaux, 32, 1000 block of Regan Rd., Breaux Bridge; probation violation (SMSO). Dustin Degetaire, 37, 1000 block of Adelle St., Breaux Bridge; OWI (SMSO). Larry Gary, 29, Houston; failure to appear, warrant, simple possession of marijuana, possession of Schedule IV narcotics, possession of a firearm committing/attempt crime, distribution of drug paraphernalia (SMSO). Brad Gates, 39, 2200 block of Bushville Hwy Breaux Bridge; violation of protective order (SMSO). Calvin Johnson, 42, New Iberia; failure to appear, warrant (SMSO). David Odu, 28, 400 block of Berard St., Parks; contempt of court (SMSO). Jesceda Porter, 29, 1400 block of Martin Luther King Dr., St. Martinville; simple burglary (SMSO). Anthony Badeaux, 24 1100 block of Salt Mine Hwy., Breaux Bridge; contempt of court (SMSO). Carol Noel, 18, Lafayette; attempted 2nd degree murder/non-negligent manslaughter (SMSO). Joseph Vidrine, 34, 1000 block of Noel Dr., Henderson; failure to appear, warrant, owner to secure registration (LSP). Kehia Vidrine, 34, 1000 block of Noel Dr., Breaux Bridge; failure to appear, warrant (LSP). Kelly Yocum, 34, 1700 block of Duchamp Rd., St. Martinville; failure to appear, warrant (SMSO). Douglas Louviere, 32, Lafayette; OWI, careless operation (LSP). James Patin, 21, 500 block of St. Claire St., Breaux Bridge; OWI, reckless operation of a vehicle, open container (LSP).